[East Asia Forum] The current face-off between Vietnam and China over the latter’s installation of its deep-water oil rig Haiyang Shiyou 981 deep within Vietnam’s claimed exclusive economic zone (EEZ) is probably the biggest test for their bilateral relations since normalisation in 1991. China’s decision to deploy the rig came despite the fact that the two countries have achieved significant improvements in their relations over the last two decades, with China now Vietnam’s biggest trading partner and one of its two ‘comprehensive strategic partners’. There have also been some positive developments in the management of the bilateral disputes over the South China Sea, such as the 2011 agreement on basic principles guiding the settlement of sea issues and the establishment of hot lines between the leaders, as well as their relevant authorities, to manage crises in the sea. But the current row over the rig threatens to undo these positive developments. A sense of brinkmanship has pervaded Vietnam in recent days as footage and images of Chinese vessels ramming and firing water cannons at Vietnamese law enforcement ships are widely disseminated via the internet and mass media channels. 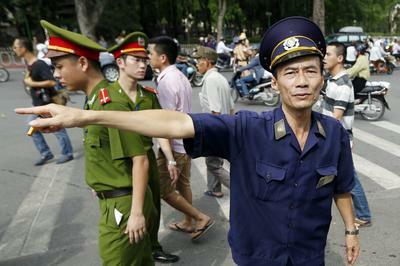 The timelines of Vietnamese Facebook users are inundated with angry comments about China’s actions. Last weekends, mass demonstrations broke out across the country in protest of China’s ‘expansionism’. There were even unconfirmed reports of Vietnam’s relocation of its troops in anticipation of a deteriorated situation. The incident, and the heightened bilateral tensions that have ensued, have also caused deep concerns across the region. The US, Japan and India have particularly criticised China’s actions. Meanwhile, the 24th ASEAN Summit in Naypyidaw last week also issued a separate statement on the situation in the South China Sea — the first time this has happened in the last 20 years. So far, there has been no credible sign that China will back down — except for the statement that it would be willing to negotiate a settlement of the issue after Vietnam withdraws its vessels, an unacceptable condition for Vietnam. It is likely then that the current stand-off will last at least until 15 August. China has announced it will withdraw the rig on this date. It does not want an early withdrawal to be interpreted as an acknowledgement of wrongdoing. The incident therefore will likely remain a serious test for bilateral ties as well as China–ASEAN relations in the coming months. Against this backdrop, a number of lessons can be drawn for Vietnam and regional countries. First, the South China Sea disputes will continue to be the most serious security threat facing Vietnam. China’s desire to assert control in the South China Sea will impede the ideological affinity between the two communist parties and the pacifying effect of growing economic interdependence. Bilateral relations will now swing up and down with each new incident, hollowing out the China–Vietnam ‘comprehensive strategic partnership’. Second, Vietnam should expect China to become more assertive in the South China Sea in the future, especially if the Chinese economy turns sour and its government takes advantage of territorial disputes to deflect domestic discontent. Disputes over fisheries may flare up as well. For example, China may send the Hainan Baosha 001, a 32,000-ton seafood-processing ship, along with its supporting fleet, into Vietnam’s EEZ in the future. Third, China seems unlikely to adopt a legally binding Code of Conduct (COC) in the South China Sea — and, if it has to, it will try to water it down. A dilemma for Vietnam and ASEAN thus emerges. On the one hand, they would like to press China into a genuine and effective COC, which they are unlikely to achieve. On the other hand, they may be unwilling to then adopt a more realist line on China and invest more in hard power capabilities to prepare for worst case scenarios. Some Chinese scholars and policy makers have considered the US rebalancing strategy, as well as the Trans-Pacific Partnership, as strategic and economic tools that the US is deploying to contain China. But these scholars should note that by reacting so strongly to what it perceives as American strategy, and acting so assertively in territorial disputes, China is encouraging the US to pursue containment. In this respect, heightened tensions in the South China Sea risk becoming a vicious circle. Next Next post: [MA] Sau “981” Trung Quốc sẽ làm gì?